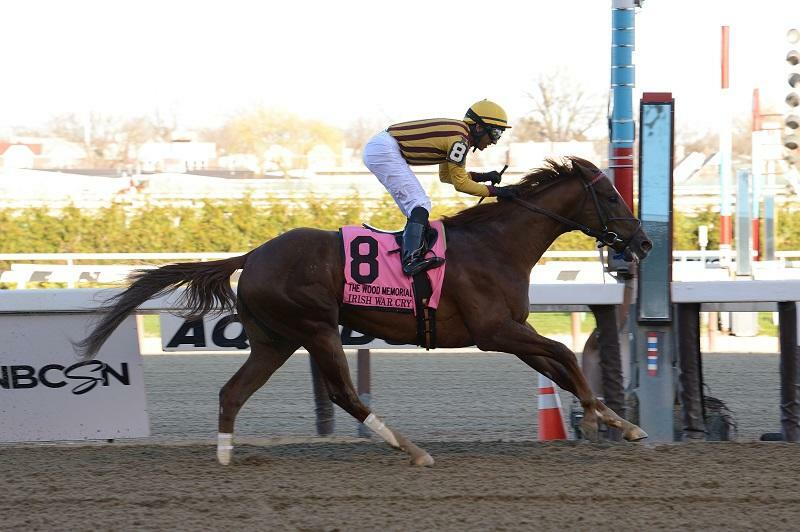 Irish War Cry regained his Kentucky Derby momentum in the $750,000 Wood Memorial (G2) at Aqueduct, recording a 3 ½-length decision in the major prep race. The Graham Motion-trained colt had questions to answer after flopping in the March 4 Fountain of Youth (G2) as the even-money favorite. With Rajiv Maragh picking up the mount on the son of Curlin, Irish War Cry resembled the 3-year-old who opened his career with three straight victories including a 3 ¾-length win in the February 4 Holy Bull (G2) at Gulfstream. The chestnut broke from the far outside post among eight Wood Memorial rivals and settled in fourth, 1 ½ lengths back of pacesetter Battalion Runner, who completed the opening quarter-mile in :23.50. Irish War Cry advanced to second entering the backstretch, a half-length behind after a half-mile in :47.34. He edged closer rounding the far turn, only a head back through 6-panels in 1:12.36, and had reached even terms as they straightened for home. Battalion Runner proved game when challenged, digging in determinedly in upper stretch, but Irish War Cry forged his way to a half-length lead with an eighth of mile remaining and drew away late. Owned and bred by Isabelle De Tomaso, Irish War Cry was off as the 7-2 third choice and finished the 1 1/8-mile distance in 1:50.39, picking up 100 points in the Kentucky Derby qualifier. He's now 4-of-5 starts and earned $699,460. Battalion Runner, the 2-1 favorite, easily head second in his stakes debut and virtually guaranteed himself a Kentucky Derby berth with the 40-point prize. It was another 3 ½ lengths to the 2-1 second choice Cloud Computing in third. After netting 20 points for a Gotham (G3) runner-up effort, Cloud Computing probably punched his Kentucky Derby ticket as he increased his point total to 40. True Timber wound up fourth at 21-1. Bred in New Jersey, Irish War Cry is the first stakes winner out of the Polish Numbers mare Irish Sovereign.